Self Esteem Activities - What Do You Believe? 2. Complete the Self Esteem Activities: What I Believe Worksheet. Elephants in captivity are trained, at an early age, not to roam. One leg of a baby elephant is tied with a rope to a wooden post planted in the ground. The rope confines the baby elephant to an area determined by the length of the rope. Initially the baby elephant tries to break free from the rope, but the rope is too strong. The baby elephant "learns" that it can't break the rope. 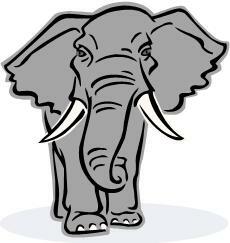 When the elephant grows up and is strong, it could easily break the same rope. But because it "learned" that it couldn't break the rope when it was young, the adult elephant believes that it still can't break the rope, so it doesn't even try! Humans operate in a similar way. We learned something about ourselves at an early age and still believe it as an adult. Even though it may not be true, we operate as if it is. Fortunately, humans are born with the ability to make conscious choices - an important step in changing how you perceive yourself. Now use the Self-Esteem-Experts What I Believe Worksheet to uncover the beliefs you learned when you were young that continue to influence your self esteem. Then ask yourself if these beliefs support or hinder you in increasing your self esteem. I visualize myself how I want to be, and I say positive affirmations that complement me. Running and doing exercise lifts the mood and makes me feel great ! Helping someone in need and seeing their sad eyes turn into a huge smile and their hearts into a world of hope. Usually what I do is I tell myself I am not my feelings I am not my emotions. Even though I can have them, they cant have me. Writing stories based on fiction. The Most Important Person in the World! Writing a weekly list of "Gratitude, Compliments and Achievements"
I chat to several friends online, and am part of a chatroom. Quiet, probably dark, me laying on the bed with my cell phone,listening to my favorite songs allowing the great music to take me away! I do an hour of walk, jog or walking outside, swimming, etc. outside. When I feel good I am happy.